Prior to World War I amateur hockey in the United States was strong in two leagues in the East, one located in Boston and the other situated in New York City. In the Midwest teams in the American Amateur Hockey Association - with members: Calumet, American Soo, Portage Lake and St. Paul - were among the best teams in the country. Cleveland, which possessed a strong team, played an independent schedule with most of their games being against Canadian clubs. Duluth also played an independent schedule with most of their games being against American teams, but occasionally they met teams from Winnipeg and Fort William. Winners of the famous Mac Naughton cup were: 1914 – Cleveland; 1915- American Soo; 1916- St. Paul; 1920- Canadian Soo; 1921- Eveleth; 1922- Canadian Soo. After 1922 winners of the cup were limited to upper Michigan teams, who had withdrawn from the USAHA after the 1921-22 season and were playing a weaker brand of hockey than the USAHA teams. Of late the cup has been contested for by teams from the Western Collegiate Hockey Association. During the war and for the season of 1919-20 the International Skating Union was in charge all of hockey in the United States and had a working agreement with the Amateur Athletic Union and the Canadian Amateur Hockey Association. The United States Amateur Hockey Association was formed on October 25, 1920 at a meeting held in Philadelphia. The ISU passed a resolution, with the approval of the AAU, to turn over control of the sport to the USAHA. 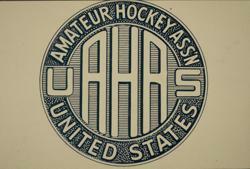 Thus the USAHA was affiliated with both the AAU and the CAHA. The clubs making up the newly formed Association were: Boston, New York, Philadelphia, Pittsburgh, Cleveland, Duluth, St. Paul and Eveleth. Later in the fall, teams from the AAHA such as Calumet, Portage Lake and Sault Ste. Marie, all from Upper Michigan, joined the USAHA. For the first two seasons the Association operated in three groups, two in the Midwest and a one in the East. For the seasons of 1922-23 and thereafter it ran as two divisions- Eastern and Western. The season of 1924-25 was the last for the USAHA as a Western division was re-organized as the Central Hockey Association for the 1925-26 season and the Eastern Division after the 1924-25 campaign disbanded. The following teams composed the newly formed CHA: St. Paul, Minneapolis, Winnipeg, Eveleth-Hibbing, Duluth and American Soo. Following the 1924-25 season Pittsburgh left the USAHA and joined the National Hockey League- using a similar lineup that they had employed in the USAHA- finished third in the seven team NHL. The Yellow Jackets lineup included: Roy Worters, Lionel Conacher, Hib Milks, Duke McCurry, Harold Cotton, Tex White, Harold Darragh, Roger Smith and Herb Drury. Lionel Conacher, who later was named Canada's athlete of the half century, came to Pittsburgh in 1923 to play football from his native Toronto. He organized the strong Yellow Jackets team by enticing his friends to join the team. Many of the best players in the game had played in the USAHA Western Division and the CHA during the early and mid-1920’s. Numerous players who had played in these leagues starred in the NHL and have been accorded various honors and selected to the Hockey Hall of Fame. Notable players were as follows: Cooney Weiland (Minneapolis), Ching Johnson (Eveleth/Minneapolis), Moose Jamieson (Cleveland), Vern Turner (Cleveland), Pat Sullivan (Pittsburgh), Tiny Thompson (Duluth), Taffy Abel (Minneapolis/St. Paul), Nels Stewart (Cleveland), Lionel Conacher (Pittsburgh), Herb Lewis (Duluth), Mike Goodman (Duluth), Moose Goheen (St. Paul), Coddy Winters (Cleveland), Roy Worters (Pittsburgh), Herb Drury (Pittsburgh), Hib Milks (Pittsburgh), Vic Des Jardins (Eveleth), Perk Galbraith (Eveleth/Minneapolis), Gus Olson (Duluth), Jo De Bernrdi (Cleveland/Duluth), Jim Cree (Cleveland), Jim Seaborn (Eveleth/Duluth), Tony Conroy (St. Paul), Babe Elliot (St. Paul), Flat Walsh (American Soo), Nobby Clarke (Eveleth/Duluth), Muzz Murray ( American Soo), Murray Murdock (Winnipeg),Chuck Gardiner (Winnipeg), Art Somers (Winnipeg), Joe and Larry McCormick (Pittsburgh), John Gotteslig (Winnipeg), Iver Anderson (Duluth), Frank McGuire (Pittsburgh), Ade Johnson (Eveleth/Minneapolis), Ed Rodden (Eveleth), Emy Garrett (St. Paul), George Clarke (St. Paul), and Bill Hill (Eveleth). During the mid twenties the team’s rosters were dominated by Canadian players with very few Americans being in the lineups, St. Paul and Duluth being the exceptions. A review of the above list of players will reveal that only ten American natives are included in the listing. Murray, Abel and Des Jardins hailed from Sault Ste Marie, Michigan, while Olson, Anderson, Winters and Clark were Duluth natives and Goheen, Conroy and Garrett came from St. Paul. Seven of these players namely: Gardiner, Goheen, Ching Johnson, Stewart, Weiland and Thompson have been elected to the Hockey Hall of Fame in Toronto, while many others had long careers in the NHL, AHL and the AHA. Stewart scored 324 goals in his fifteen year NHL career which placed him first among players of his era. Six man hockey, rather than the seven man game, became common in most of hockey in the United States for the season of 1920-21. In the early days of the USAHA rosters were usually small in number. During the early 1920’s a total of seven to nine players saw action in a game. Often a player would play the entire contest without relief. By the mid-twenties eleven or twelve players were used in a game. Spare goalies were not always carried and in case of an emergency an extra forward defenseman had to don pads, or a goalie attending the game might be permitted to replace the regular goalie. Refereeing was a continuous problem, especially in the early years of the association. Later referees were imported from Winnipeg and Ontario and two were employed, instead of one that had been used. During a game in Soo, Michigan, Ed Fitzgerald, St. Paul coach, protested a ruling by the referee and informed he official that the rule was not in the rule book. The referee said, “There ain’t any rule book. Up here it is played the way I say.” Then he tore the rule book into two parts and threw it into the crowd. Time-keepers were local individuals who sat on the home team bench and often adjusted things to suit the home team. Fitzgerald recalled that at one game he was checking the time with this own watch and then the time was over he yelled to the referee that the game had ended but to no avail. So he got mad and threw his watch at the official, still there was no action by the referee. At the start of the initial USAHA season of 1920-21 only two teams in Group Two and Three, namely, Pittsburgh and Cleveland had artificial ice, while American Soo, Calumet, Houghton, Duluth, Eveleth and St. Paul had to be content with using natural ice. This gave Pittsburgh and Cleveland along with the Group One teams a great advantage in getting an earlier start and playing later in the season. At times some of the home playoff games of St. Paul, Duluth and Eveleth had to be moved to their opponent’s home ice or to a neutral rink. Attendance during the existence of the USAHA for the larger cities of Pittsburgh, Cleveland and St. Paul averaged 3-4,000 fans per game depending upon the team's opponent. Smaller cities such as Eveleth (population 7,000) and Duluth (population 98,000) often drew sellout crowds in their buildings seating 3,000 and 2,000 fans respectively. During the seasons of 1920-21 and 1921-22 most of the teams of Upper Michigan did not draw well and after the 1921-22 season withdrew from the USAHA. In 1922 St. Paul, with the rink that held 7,800 spectators, drew an excess of 50,000 fans to a series of playoff games against Eveleth and Boston. When Duluth and Minneapolis moved into new modern rinks they drew many crowds of 4-5,000 fans. According to those who played the game during this period hockey was an extremely rough sport. Old-timers like Moose Goheen, Andy Mulligan, Moose Jamieson and Ching Johnson tell of playing in games where they had injured elbows and knees and their bodies were carrying dozens of recent stitches. Emy Garrett, St. Paul forward, stated: “When we started on a road trip to other rinks it was like going to war. Visiting teams often lost and had to be escorted off the ice by police.” Eveleth, St. Paul and Duluth dreaded visiting the small rinks of Upper Michigan. Moose Goheen thought of all the rough and rowdy games in which he had competed in his nineteen seasons he stated: "The toughest was the 1922 playoff series between St. Paul and Eveleth where the penalty boxes were usually filled. With large crowds attending games at both St. Paul and Eveleth, St. Paul edged Eveleth three games to two in the series scoring seven goals to Eveleth’s six, with two of the contests ending as scoreless ties." For the following season of 1926-27 the first professional league in the Midwest was formed as Eveleth-Hibbing and Canadian Soo decided not to join the professional forces, leaving Minneapolis, St. Paul, Winnipeg and Duluth of the defunct CHA, along with newcomer Chicago to form the five team American Hockey Association. 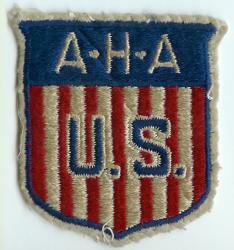 The AHA, with many franchise changes, operated for seventeen straight seasons, was forced to cease running after the 1941-42 campaign due to World War II.